Your children may not have the proverbial 'green thumb', but they can still be creative & get enjoyment from being in the garden. We’re always looking for creative ways to get children outdoors and keeping busy. Here are some simple tips on getting them into the garden and entertained for hours on end. Create the ultimate play area for your kids, by incorporating the following ideas. Make a chalkboard built from recycled wood and chalkboard paint. Sandpits never fail to captivate children. Build one from child friendly recycled pine, or treated timber. A cubby house is a clever way to create a space where kids can hang out and retreat from the sun. Use natural materials for the exterior of the cubbyhouse, like marine grade plywood and hardwood, these timbers will keep the heat out on sunny days. If nothing else, the most simple and obvious - a grass area as kids love to run, play and kick a ball. 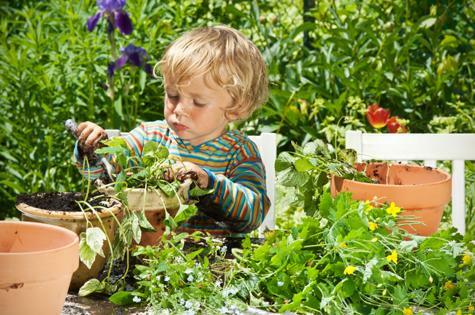 Teaching children how to get involved in the gardening process will make them eager to get outside. Buy your children their very own gardening kit. This is a clever incentive that will leave them eager to participate in gardening activities. Choose plants that are easy to grow, such as tomatoes, sunflowers, lettuces, squashes and beans. Personalise the garden so that it becomes a special place for children. For example, plant a tree for each child and at each birthday compare the child’s height to the tree’s height. This is an inspiring way to keep kids interested in nature and the way that things grow. Plant a veggie patch - picking from the veggies patch is an enjoyable activity that parents can do with their kids. Incorporate wildlife in your child’s gardening experience by adding a bird bath, with a small pond for fish. Children love to see the different animals in the garden. Get inventive by creating handmade decorations or tools with your children, made from recyclable materials. Create plant and herb markers from old paddle pop sticks. Get the kids painting old pot plants with bright and bold colours. Make fun dangling garden decorations from beads, shells and pebbles, hang these with thread, or fishing line.Turn coconut shell halves into seedling pots. Clean the inside, paint the outside like a face and anything that sprouts will seem like hair. Recycled egg cartons are also great for making seedling pots. Make plants out of vegetable scraps- while they don’t grow edible produce; they make a fun activity for kids, who can watch them sprout week by week. Kids prefer everyday objects over expensive play equipment.